The first thing you see to the left upon passing the large stone "Welcome to Cupertino" sign is Apple Inc.'s world headquarters, on the playfully named One Infinite Loop. For fans of Steve Jobs, there is no greater Mecca than this sleepy San Jose suburb. There's his childhood home, a simple suburban ranch at 2066 Crist St., the garage of which served as Apple Inc.'s birthplace. Less than a mile up a road where one could easily imagine a young Jobs biking is his junior high. And a mile beyond that  practically within sight of Infinite Loop  is his high school. Jobs led the world into the computing era, but physically, he rarely left a 20-mile radius that centered around his boyhood home. "Apple is a company that has grown up with our city," says Rick Kitson, Cupertino's public and environmental affairs director. "The city was only incorporated 55 years ago and for 35 of those years we've been home to Apple. It's only 11 square miles, so Apple really put our town on the map." Cupertino was named for Joseph of Cupertino, an Italian saint who, though dim-witted, was known for his miraculous ability to levitate. Thus, he became the patron saint for air travelers, aviators, astronauts and the mentally handicapped. For much of the 19th and 20th centuries, the town, nestled in the "Valley of Heart's Delight," was mostly home to orchards and vineyards. It wasn't until the 1950's post-war boom that the town incorporated. Apple made its headquarters here in 1976, but the relationship between Jobs and his hometown has been remarkably unsentimental, at least publicly. Steve Jobs never spoke at his alma maters or gave them money  classic behavior for a man who ran the largest Fortune 500 company without a customer feedback division. There are no buildings named after him in town, no statues in his honor. Indeed, Cupertino City Hall runs on PCs. While Hewlett Packard, which also has a campus in Cupertino, would have annual philanthropy days, Apple Inc. remained markedly aloof. "Steve kept his philanthropy very private, his involvement in community very private," says Larry Sonsini, a Silicon Valley lawyer who represented Jobs for years. "He was proud of the fact that he grew up in a humble way in the tech arena. He strongly believed in the concept that the community should be cultivated in a way to support entrepreneurial aims, technological growth. He was very holistic about it." Indeed, when Jobs was the head of Pixar studios, he worked closely with the town to place the company at the heart of the community, rather than outside it, "so it was good for employees and good for the vendors," Sonsini says. "He wanted it to be in the center of the town's geography." As Cupertino has grown  it now has a population of about 60,000  its development has been marked by its largest employer. In 2000, the city was one of only two in the United States with a population over 50,000 and a median income over $100,000. The town boasts some of the best schools in the country and some of the lowest unemployment and poverty rates. "We have an unofficial motto in Cupertino," says Kitson, who like more than half of the town's residents were born and bred there. "We're boring for all the right reasons." What's next for Cupertino? Even before HP announced in July 2010 that it would close its 3,000-person Cupertino campus, Jobs had unveiled what the locals call 'Campus 2.0.' He purchased 99 acres of the HP property and planned to construct a new global and expanded headquarters for Apple  a building employees call 'the donut' because it's designed to look like a real-life infinite loop. It will employ more than 12,000 people. "Steve Jobs has left an enduring legacy not only for his company but for Cupertino," says Cupertino Mayor Gilbert Wong. "Cupertino depends on Apple's success and we're going to work to maintain that success." Jobs may not have a statue in his honor, but he's clearly loved here. 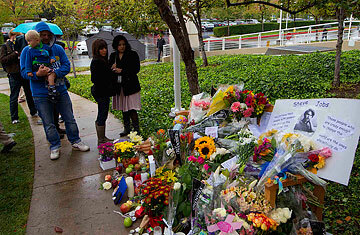 For two days now, locals have streamed through One Infinite Loop leaving flowers, poems and even a song or two. "He may not have been public about it, but he was the heart of this place," said Omid Mirshafiel, 28, an instructional designer at Citrix who attended the same middle and high schools as Jobs. "We heard about him growing up, all of our lives. He was our inspiration." See photos of Steve Jobs' TIME covers. See a two-minute video of Steve Jobs' career.